Office 365 でグローバルまたは SharePoint 管理者である場合は、既存のサイトをハブサイトに変換できます。If you're a global or SharePoint admin in Office 365, you can convert any existing site to a hub site. コミュニケーションサイト、または新しいテンプレートを使用するチームサイトを選択することをお勧めします。We recommend selecting a communication site, or a team site that uses the new template. 従来のチームサイトを使用する場合、ハブナビゲーションはモダンページにのみ表示され、ハブサイトの設定はモダンページにのみ表示されます。If you use a classic team site, the hub navigation will appear only on modern pages, and hub site settings will only appear on modern pages. 既に別のハブに関連付けられているサイトをハブサイトに変換することはできません。Sites that are already associated with another hub can't be converted to a hub site. ハブ サイトは、1 つの組織に対して最大 100 サイトまで作成できます。You can create up to 100 hub sites for an organization. ハブサイトに関連付けることができるサイトの数に制限はありません。There is no limit on the number of sites that can be associated with a hub site. ユーザーが自分のサイトをハブに関連付けても、ハブサイトのアクセス許可や関連付けられているサイトのアクセス許可には影響しません。When users associate their sites with a hub, it doesn't impact the permissions of either the hub site or the associated sites. ハブにサイトを関連付けることを許可するすべてのユーザーが、ハブに対するアクセス許可を持っていることを確認することが重要です。It's important to make sure all users you allow to associate sites to the hub have permission to the hub. 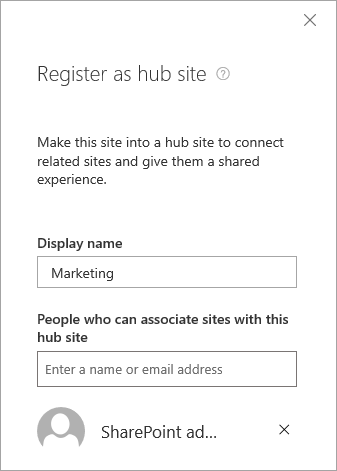 新しい SharePoint 管理センターの左側のウィンドウで、[アクティブなサイト] を選択します。In the left pane of the new SharePoint admin center, select Active sites. サイトを選択し、[ハブサイト] を選択し、[ハブサイトとして登録] を選択します。Select the site, select Hub site, and then select Register as hub site. [ハブサイト] メニューを使用すると、サイトをハブサイトに関連付けたり、サイトの関連付けを別のハブサイトに変更したり、サイトとハブサイトの関連付けを解除したりすることもできます。Using the Hub site menu, you can also associate a site with the hub site, change a site's association to a different hub site, or disassociate a site from a hub site. ハブ サイトの表示名を入力し、サイトをハブに関連付けることを許可する個々のユーザーまたはセキュリティ グループを指定します。Enter a display name for the hub site and specify the individual users or security groups you want to allow to associate sites with the hub. [このハブにサイトを関連付けることができるユーザー] ボックスを空のままにしておくと、任意のユーザーが自分のサイトをハブに関連付けることができます。If you leave the People who can associate sites with this hub box empty, any user can associate their site with the hub. 後でハブサイトの表示名、またはサイトをハブに関連付けることができるユーザーの一覧を変更する場合は、PowerShell を使用するか、ハブサイトの [ハブサイトの設定] に移動する必要があります。If you later want to change the hub site display name or the list of people who can associate sites with the hub, you need to use PowerShell or go to hub site settings on the hub site. サイトがハブに参加したときに適用されるサイトデザインの使用方法については、「ハブサイトのサイトデザインをセットアップする」を参照してください。For info about using a site design that gets applied when sites join the hub, see Set up a site design for your hub site. サイトデザインとサイトスクリプトの詳細については、「 SharePoint サイトデザインとサイトスクリプトの概要」を参照してください。For more info about site designs and site scripts, see SharePoint site design and site script overview. Microsoft PowerShell を使用してハブサイトを作成および管理する方法については、「 SharePoint ハブサイトを管理する」を参照してください。To learn how to use Microsoft PowerShell to create and manage hub sites, see Manage SharePoint hub sites. サイト所有者がハブサイトをカスタマイズする方法の詳細については、「 SharePoint ハブサイトをセットアップする」を参照してください。For info about how site owners can customize hub sites, see Set up your SharePoint hub site. ハブサイトの削除の詳細については、「ハブサイトを削除する」を参照してください。For info about removing a hub site, see Remove a hub site.